Here's an MBTA thread devoted to the ups and downs of the buses. I'm going to start with the provocative point: in any system that hasn't been modified in a while, there are likely to be lots of underserved lines, and, at the same time, over served lines. This seems particularly true of bus routes, even though one of their original virtues (vs streetcars) was supposed to be the ease of adapting service to demand. Some may weep that bus ridership (orange) is down. I rejoice that it looks like they did a great job of cutting underused lines (blue) while suffering little ridership losses. In fact, I'd say the CTA did a great job of trimming costs--whacking 25% of bus miles--without trimming benefits near as much (losing only 8% of ridership. It suggests that the buses whacked were only 1/4 as full as the ones that didn't get whacked. In Boston, you could do the same thing, although as smart-or-smarter would be to redeploy the cut buses onto busy routes and really boost their frequency--and drive ridership even higher. I'd say, for each bus garage, cut service on the slowest route, combine the next two slowest (that can be easily combined) and redeploy that bus on some top 5 route that would likely reward that bus with expanded ridership. I suspect that I'm going to want to peruse the most recent Blue Book to find a good example. Per the FTA's National Transit Database, The MBTA direct-operated bus network has one of the highest numbers for passenger trips per vehicle revenue mile in a modal comparison to all other bus systems in urban areas (you can do calculations for the other modes as well). As a comparison, the Houston bus network in 2013 carried 1.88 passengers per vehicle mile of bus service. Well I'd love to at least see a full-throttled conversation about refactoring, especially if it's been 20-years since some routes have been analyzed. I have often wondered, does the MBTA adjust schedules and # of buses based on changes to neighborhoods? (Serious question.) For example, the #9 is always packed between 7-9 and 4-7 (roughly). Has ridership gone up? Does anyone measure that? Did anyone think adding thousands of units of housing during the past decade would require more buses? Again, I'm being serious, not just whining. The process got postponed by the fare increase and service reductions that were implemented in 2012 and continues to be delayed. The Route 9 has changed over the years, 40 years ago in 1975, the bus was scheduled in the morning rush hour to run every 8 minutes with 5 buses and only went as far as Broadway & Tremont St. Today it is scheduled to run every 5 minutes with 14 buses and continues all the way to Copley Sq. It's more than just a few people that use the stops in that segment. In the Dudley-bound direction (inbound), the stop at Brighton Ave @ Cambridge St has 536 people getting on and 141 getting off each weekday. ^ nonetheless, rounding that loop in rish hour sacrifices immense amounts of time. if people care that much they can hop on the 57, or walk. but waiting for a 66 anywhere along the route, check a phone app and youll see all th ebuses bunched up at union. the time lost doesnt justify those numbers. im sure at least half of them would walk down to harvard if things changed. Yeah, Union Square Allston is a major bus node. It's also the 57's busiest stop outside of Kenmore. It's rather unfortunate that there's no direct route from Harvard & Comm to Union Square (there's a hill in the way). There's also a fairly sizable environmental justice/SJ-impacted community served by the Union Square bus stop that would be put out by a rerouting of the 66 to Harvard Ave straight-through. I wouldn't want to re-route the 66 without finding a better solution for them. Cambridge Street is an absolutely awful place to walk right now. The MBTA could have an app that allowed people to enter their home address, work address and work schedule and from that you could create an optimal schedule for the upcoming week. Might take a while to run that, but it wouldn't take forever if you threw enough cloud computing resources at it. Worth a trial. You continue to come up with unworkable solutions to solvable problems. What? You don't think it is brilliant to change the bus schedule from week to week? Yeah, nobody ever goes anywhere but between home and work on precisely the same schedule every day that they can predict for the next week. We already fought off plans to get rid of the street parking for a third travel lane on Cambridge Street. That's what some of the car guys wanted, cause "Union Square is so congested!!". If the street parking goes, it's not being replaced by a bus lane, it's being replaced by a general travel lane, and all of the problems that brings. The city, thankfully, put their foot down and said that they're not ever going to consider it, as it's dangerous enough there as things stand. Woo hoo! 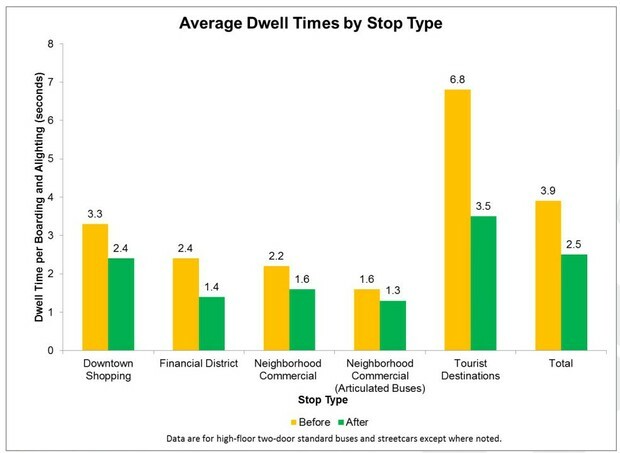 The data has begun to flow and the Final Report is available from San Francisco Muni Bus' switch to all-door boarding, and it looks great. Fare evasion unchanged (down slightly), but boarding time per rider is sped way up, and overall buses are dwelling for shorter (and more predictiable) periods of time--raising average trip speeds and (one presumes) improving schedule performance. Any system with fairly high boardings per bus (Boston is high but not tops as we learned upthread) can see the biggest gains from uncongesting the boarding process. This is *exactly* the kind win that the T should be looking for if it is to reinvent itself with both faster/oftener service and lower costs. It is one of those Southwest Airlines moments where customers get happier, trips get faster, unions get more productive (justifying decent wages), and capital gets used more efficiently. At the cost of rear-door electronic readers and 13 new inspectors, time per passenger boarding has been sliced and dwell times are down too. While tangents plan would not work for the T, it sounds an awful lot like what Bridj is trying to accomplish. The MBTA would do well to collaborate with them on data sharing.